The largest and highest quality coffee beans. Mellow, aromatic body with some spicy afternotes. Low caffeine content. Aloha Island 100% Pure Kona Gold Espresso Roast Coffee Beans 8oz Bag contains dark roast 100% Kona coffee beans. Mauna Loa Kona blended gourmet coffee, mauna loa kona whole bean coffee blends and specialty blend of 100% kona fancy and high grown gourmet coffee beans. 5lb bag, whole bean, regular. Hawaiian Kona Fancy gourmet coffee, real kona fancy whole bean coffee and specialty varietal ground kona coffee from hawaii. 16oz bag, whole bean, regular. New York Coffee 100% Kona Coffee Beans 1LB Bag contain one pound of the buttery smooth coffee that has made the coffee-growing region of Hawaii famous. Mauna Loa Kona is our exceptional smooth, complementary coffees and highlighed with pure coffee from Kona. Simply put, it's a remarkable Hawaiian blend. 5lb bag, drip grind, regular. Mauna Loa Kona is our exceptional smooth, complementary coffees and highlighed with pure coffee from Kona. Simply put, it's a remarkable Hawaiian blend. 16oz bag, drip grind, regular. New York Coffee Hawaiian Kona X-fancy Green Coffee Beans 1lb Bag produces cup after cup of unroasted green coffee from New York Coffee Beans. Mauna Loa Kona coffee blend, mauna loa kona whole bean coffee blends and specialty blend of 100% kona fancy and high grown gourmet coffee beans. 16oz bag, whole bean, regular. 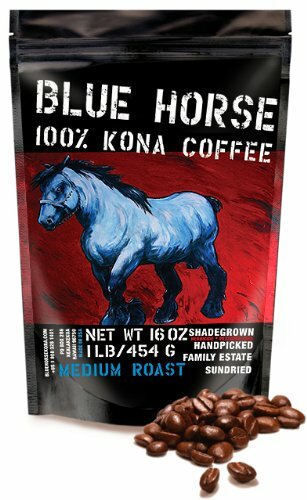 Kona Premium Private Reserve Roast Coffee Beans 1LB Bag brews cup after cup of mellow, buttery Kona coffee from Kona Premium Estates Coffee Beans. Kona Premium Estate Roast Coffee Beans 5LB Bag bulk quantity prepares many pots of whole bean mellow, bright Kona coffee by Kona Premium Estates Coffee Beans. Kona Premium Estate Roast Coffee Beans 1LB Bag regular beverage service quantity brews many cups of mild and buttery Kona coffee from Kona Premium Estates Coffee Beans. Aloha Island 100% Pure Kona Gold Espresso Roast Ground Coffee 8oz Bag contains dark roast 100% Kona ground coffee.